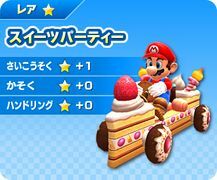 The Sweets Party is a cake-themed kart in Mario Kart Arcade GP DX. The front has a large strawberry decorating the hood, and the back has two candles protruding from it. The wheels are designed to resemble frosted donuts. The Sweets Party's alternate colors are dark brown and pink. A similarly dessert-themed kart appeared in Mario Kart Arcade GP 2. In that game, it was exclusive to Ms. Pac-Man, but was not officially named. This page was last edited on March 6, 2018, at 18:59.